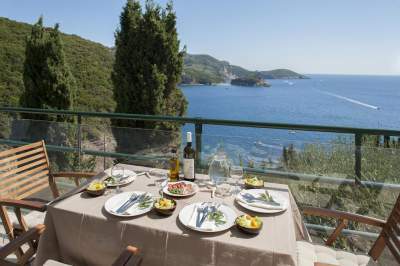 Group Accommodation Corfu Accommodation suitable for Large parties groups OR Extended Families for big occasions on Corfu Greece in. 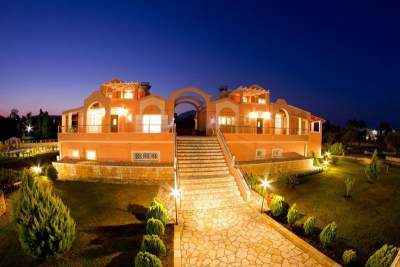 Large Greek Villas. or the smaller section of the villa that sleeps 10 people. The stone-built holiday complex features romantic, country-style interiors with distressed wood furnishings, organic materials and hand-painted details. Each unit consists of 2 bedrooms, a living room and a fully equipped kitchen. Among others facilities include a SMEG fridge, espresso coffee maker, washing machine and flat-screen TVs with DVD player. Guests can enjoy the views from the sea-view balconies, sit on the shaded, furnished patios or relax on the hammocks in the garden. Wooden sun loungers can also be found on the deck around the pool. Thalia’s staff can arrange for super market delivery, as well as meals delivery service. Free Wi-Fi is available throughout the estate and free private parking is also possible. The nearest beach is 50 metres away from the complex, while bars, restaurants and a playground can also be found within proximity. The main town and port of Corfu are 40 km away. Restaurants and shops are within a 3-minute walk. The ground floor features a rustic-style living room with beamed ceiling, sofa, fireplace and dining area. There is a fully equipped kitchen with stove, microwave oven and coffee machine. All bedrooms offer air conditioning and sound proofing. Each offers sea views. Staff can arrange massage services on request. The area offers many hiking opportunities. Guests will find a bar within 50 metres. The airport and the scenic town of Corfu are located 25 km away. Free private parking is possible on site. The spacious villa comes with a fireplace, satellite flat-screen TV and DVD player. It has a kitchen with full equipment and dining table, and bathroom with a spa bath and hydro massage shower. Air conditioning, a washing machine, a dishwasher and safety deposit box are standard. A chef can prepare various dishes on request. BBQ facilities lie in the premises of Kapetan Alekos. Grocery stores, taverns and cafés are 600 metres from the property. Island’s capital, Kerkira Town, is 12 km away. A tennis court is at a distance of 3 km. Free private parking is possible on site. Isabella Country House is a complex that consists of small picturesque apartments situated just 400 meters away from the village of Gouvia, and 700 meters from Gouvia Marina. Relax on the terrace and in the garden. Take a refreshing swim in the pool. When ready, have fun using the barbecue facilities. Write home about Isabella Country House using the free Wi-Fi internet access. Country House Isabella consists of two beautiful villas built in a colourful garden covering 5,000 square metres. It offers a friendly, family atmosphere to guests. It is an ideal place for holidaying in a calm, relaxed environment as well as getting in contact with the beautiful nature of Corfu. Be rowed around the underground lake in awe of your surroundings, and hear the fascinating story of how the water comes to be there. Home to the remains of Saint Gerasimos, patron saint of Kefalonia. In the garden is the large plane tree that was planted by St Gerasimos in the 16th century. While inside the ornate church you can see his remains – after death he did not decompose, a feat that prompted his canonization. With church interior that is quite amazing. It is a working monastery, so all the usual rules about dressing modestly apply. The islands capital, the place for you if you enjoy people watching whilst enjoying a lovely meal in the evening. Great outdoor cafe society. Many shops, restaurants and tavernas. Picturesque harbour village, which survived the big earthquake of 1953. Why not spoil yourself with a touch of luxury on a skippered yacht charter or for the more independent hire a boat from resorts such as Katelios and Aghia Efemia (one of the prettiest villages on the island) to explore the coves and tiny beaches unreachable by car. There are also activities such as Sea Kayaking available for the more adventurous! And not forgetting that there are also daily ferries from Kefalonia to Athens, Lefkada, Ithaca, Zakinthos, Patra, and Kallini Group Accommodation Corfu. Take A Break Holidays takeabreakholiday, Group Accommodation Corfu.